Tri Training Harder: Can I Run With Power? Can you hold a meaningful pace here? Running with a power meter as discussed in previous articles doesn't correlate as easily to cycling with power. However, the principles are the same. By monitoring your running power, you are measuring an input to your performance, not an output based on your performance. However, the issue when it comes to running with power is that it is impossible to act as a prediction of performance. If you increase power, then you may be working harder, but due to the nature of running, reducing your efficiency! Therefore, it is harder to use as a predictor of performance than say the W/Kg tables famous in cycling. In fact with several of my athletes, running faster actually resulted in lower power numbers. Clearly indicating the limited use of the power as a predictor. We still need to use all information available to us - Speed, HR and Power but it certainly makes you think when you have that power number: "Am I being as efficient as I can be? ", "Am I running as consistently up and down hills as I should be?" Training dosage though becomes a lot more accurate. Previous measurements were using pace as the key to training stress. Clearly this has issues on hills or when on worse surfaces (think muddy cross-country terrain). Therefore, you would have a lower recorded training dosage (or TSS) value which could mean your recovery time is biased. Using power, this difference is picked up and now you can calculate the work done per second (Watts) for the run, which is unaffected by the pace. This shows a truer example of the effort of a run and thus can ensure we give more accurate training stresses, allow for recovery time and set more accurate training dosages to allow optimal performance gains. Looking through a running file, we can see how effective your running actually is. Terrain or fatigue can slow you down, but do you know if this is proportionate, or are you losing form as you get tired? Are you slumping into the hills. These pieces of information just didn't exist through monitoring pace and heart rate. See more in the section on biomechanical awareness. 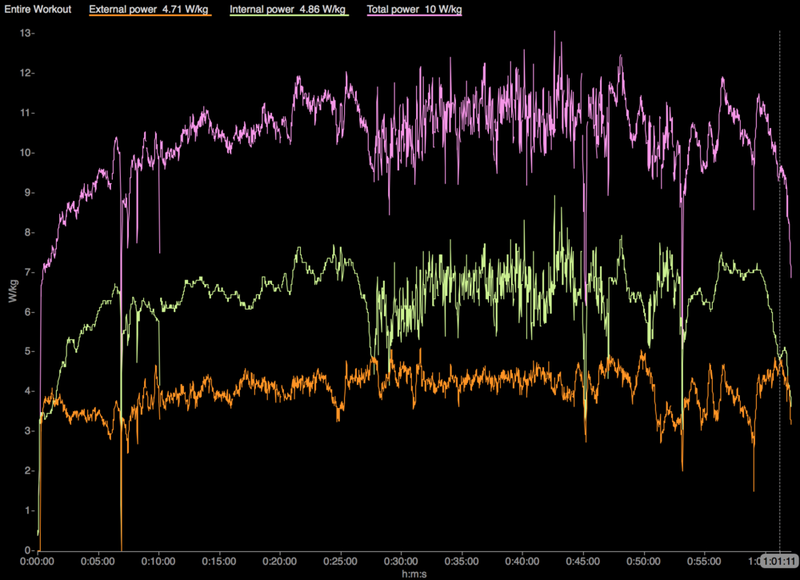 In this building run below, we can see that effort in (power) relatively matches pace and heart rate. However, as soon as hills or fatigue sets in, this is less paralleled. We can see here that there is more variance with pace but also there is decoupling, so a lower pace at the end of the run. However, the power remains fairly consistent for that last block. This shows how on longer runs, as the body fatigues, traditional "pace" orientated measures of training doses may be inaccurate. Also, we can an ensure a more steady effort without worrying about pace changes. For the final hill, we can see the effort was more or less constant, although the pace dropped off. We can plan for the run based on effort, not based on pace. Previously, if we had said run off the bike and try and hold x-pace, it may have been difficult based on the fact your muscles were getting into running, or perhaps you had pushed harder on the bike than anticipated. However, what we have the opportunity of doing now is taking the effort which we know you can hold for a set duration and hold a wattage, not a pace. Then it is down to your biomechanics to improve your speed, without sacrificing effort and then blowing up in the second half of the run. Clearly this only works effectively after collecting training data and it is a cyclical process. However, the principle is true for all racing. If you need to average 14km/h for a sub 3 hour marathon, but your body can only sustain 275 watts for 3 hours. 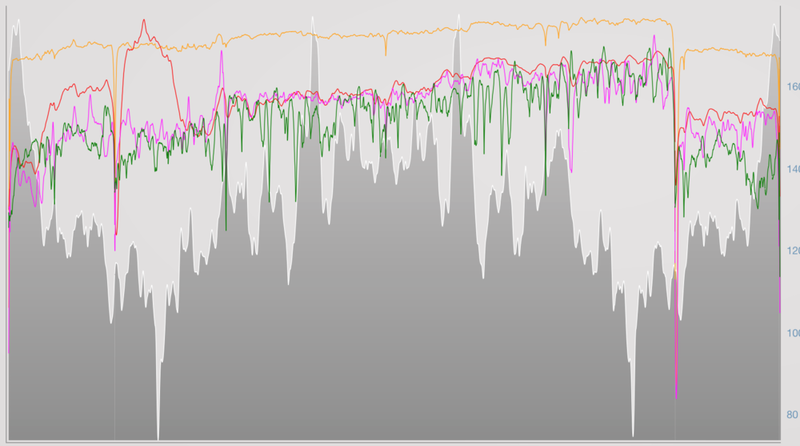 Holding 14.1km/h at 290 Watts for the first half of the run is only likely to end in your tears! We now also have the chance to learn more about how you generate your speed looking at your internal, external and rotational power as well as leg stiffness, ground contact time, flight time, duty factor, maximum force at impact which can only allow us to better understand the athlete, flag up potential injury issues and improve efficiency as well as monitor changes through a session as well as monitroing changes over a season. So much more meaningful and insightful data! Yes, running power is very much in it's infancy, but the truth of the matter is that it is beginning to develop and fast. 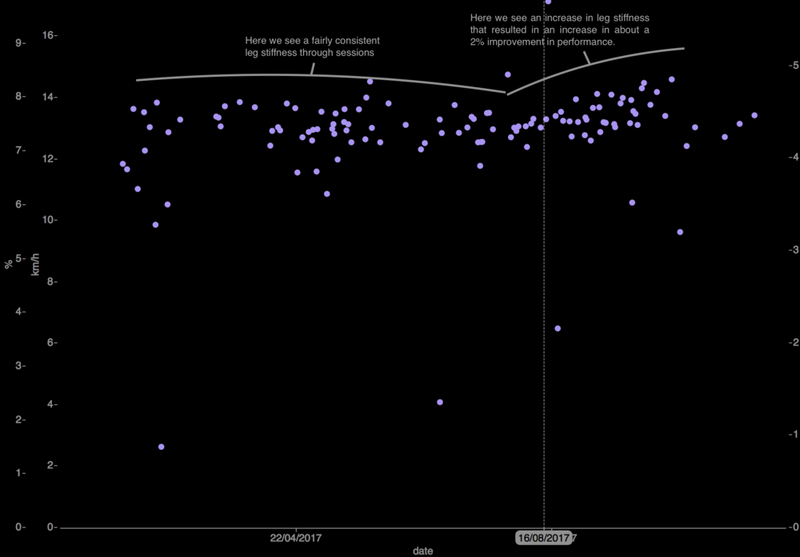 The more data points you can enter here, the more you can understand what is going on with yourself, the quicker you will begin to improve. However, this hasn't yet been the all encompassing shift like we have seen in cycling. This is more complicated. Nevertheless, our verdict is to watch this space very carefully as you start to see more and more of the top athletes moving to measuring these values in order to maximise their efficiency in training and thus make performance improvements.